An ocean runs through it. A lone sailor fights for his life after his sailboat springs a leak in the middle of the Indian Ocean. That's the concept of All Is Lost, an extremely exciting action adventure written and directed by J.C. Chandor (Margin Call). The film is exciting not only in its tale of perseverance and courage in the face of unforgiving nature and bad luck, but because it throws away almost everything that usually makes a big-budget Hollywood movie of this type viable. There's no one on board the Virginia Jean when it bumps into a floating container of athletic shoes, 1,700 miles west of the Sumatra Straits, except the skipper, played by Robert Redford. No one to fall in love with during a break in the action. No one to yell orders to. No one to even converse with — the waterlogged radio goes dead early on. We never even learn the sailor's name because he refuses to talk to himself like Tom Hanks. The movie is just a series of actions and reactions based on staying alive when your boat sinks and you're left utterly alone on the deep. There's nothing anywhere more important than that. It's easy to hypothesize that Chandor's movie might never have gotten made without the presence of someone as "bankable" as Redford. It has the tone of those stripped-down European indie nail-biters, like the Danish film A Hijacking earlier this year, in which there's no movie star to distract us from the task at hand. At any rate, we soon forget that we're looking at the iconic star of Butch Cassidy and the Sundance Kid, and instead watch intently as he fashions a condensation tent to collect drinking water, lashes together a life raft, etc. Sure, once or twice we notice that even at 77 years of age, the impossibly handsome Redford resembles an Eddie Bauer model in distress. But there are all those sharks to contend with. The best thing about open-sea survival movies like Dead Calm, the magnificent Abandon Ship with Tyrone Power, Hitchcock's Lifeboat, or even the otherwise disappointing Life of Pi, is the immensity of the opponent. If it's done right — and All Is Lost certainly is — the ordeal envelops us with each roll of the waves. 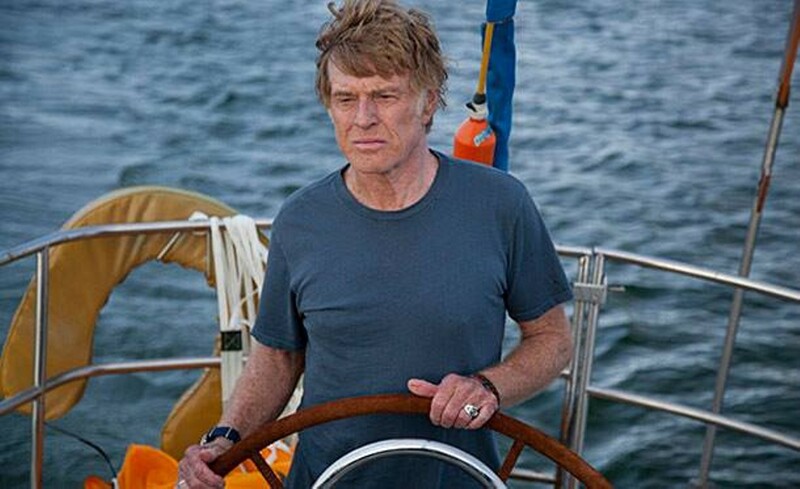 All Is Lost is not showing in any theaters in the area.